Does your nighttime routine consist of scrolling through your iPhone until you get so tired that you accidentally drop your phone on your face? Yeah, me too. Good health cannot happen without good sleep. And good sleep cannot happen without good sleeping habits. Want to know what’s not a good sleeping habit? You guessed it, technology right before bed. Improving your sleep will improve your productivity, your mood, and your overall health. And there’s another obvious benefit: that relentless fatigue you’ve come to accept as normal will be replaced with energy. But enough talk. If your goal is to get better sleep by tonight, you’ve come to the right place. Here’s how to start building habits that will set you up for a life of good night’s sleep. Your body needs some time to go from “awake” mode to sleep mode. 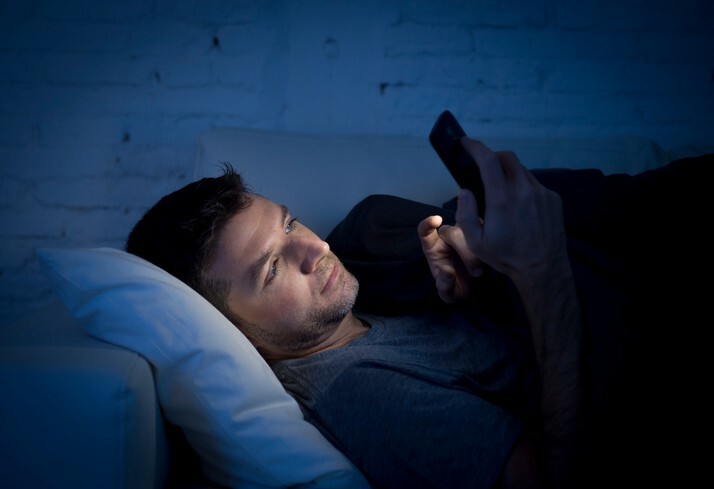 One of the best things to do to help your body get ready for sleep is to turn off electronic devices before you get into bed. The light from devices keeps your brain turned “on” when you want to turn your brain “off.” If an hour before is a bit of a stretch for you, start with 30 minutes prior, or even 15 minutes. Create a designated space to keep your laptop, iPad, and phone overnight — and make sure it’s out of reach from your bed. This can be a really tricky thing for many people. Don’t beat yourself up if you find yourself writing emails from under the covers one night. The goal here is to make a concerted effort to be better, not perfect. Ask yourself these questions: What relaxes you? What is something you find soothing? What makes you feel comfortable? These are the kind of things you’re going to look to do before you go to bed. For example, if a warm shower or bath decompresses you from the day, think about making that part of a nighttime ritual. Or if a cup of hot tea is is something that allows you to sit and take a deep breath, that will help you transition to a state of relaxation. A nighttime routine steeped in relaxing activities creates an important transitionary state that will carry you to sleep. Is your bed comfortable? We can get buried in all the details surrounding sleep, but let’s not forget the fundamentals, a.k.a., your bed, pillows, blankets, the lighting, the noise. One of the best parts of sleep is sinking into a cloud of comfort. Is your mattress current (it shouldn’t be older than 10 years) and comfortable? If not, consider investing in a new mattress, or even just a mattress topper. Are your sheets and comforter comfortable and warm? If you’re waking up with a stiff neck, change your pillows STAT. The National Sleep Foundation says that your room should be dark and quiet. If you happen to live in a street-facing apartment, an eye mask and earplugs can work wonders. Don’t worry, this article is NOT going to tell you to stop drinking coffee. However, it’s important to monitor your caffeine intake in order to sleep well. A good rule of thumb is to stop your caffeine intake around 2:00 pm. This one is easier said than done, of course. But we all know that nothing is worse than feeling totally exhausted while lying in bed wide awake with a brain that refuses to shut off. A couple quick and easy ways to help you de-stress before sleep include reading a book, stretching, breathing, or writing your to-do list for the morning. Good habits are born from repetition. You’re not going to transform your sleep schedule and routine in one night, or one week, or even one month. Introducing, and keeping, good habits takes time. The key here is a commitment to consistency. Try to go to sleep around the same time every night, and try your best not to use your electronic devices in bed. Make an effort to establish a routine. The payout will be worth it. After all, is there anything better than waking up feeling rested and refreshed? Originally published at www.glassdoor.com on March 16, 2017.